Today, after pulling a few thistles and picking some strawberries, we abandoned our gardening and got out the brand new sidewalk chalk. The sun was out and the driveway a blank canvas for the boys to draw shapes and mazes. 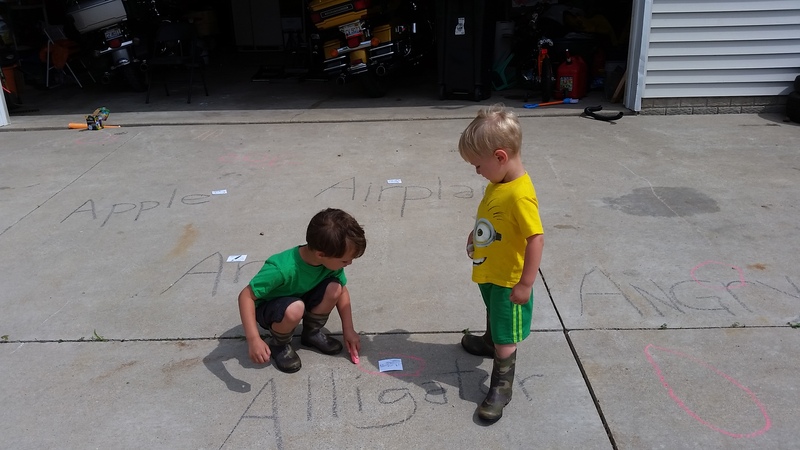 After Joe wrote his name and drew a few circles, I went inside to get word and picture matching flashcards I had laminated earlier in the morning. I’ve started a “letter of the week” program that I found on Pinterest on a site called alittlepinchofperfect.com. I ran inside and grabbed the flashcards. 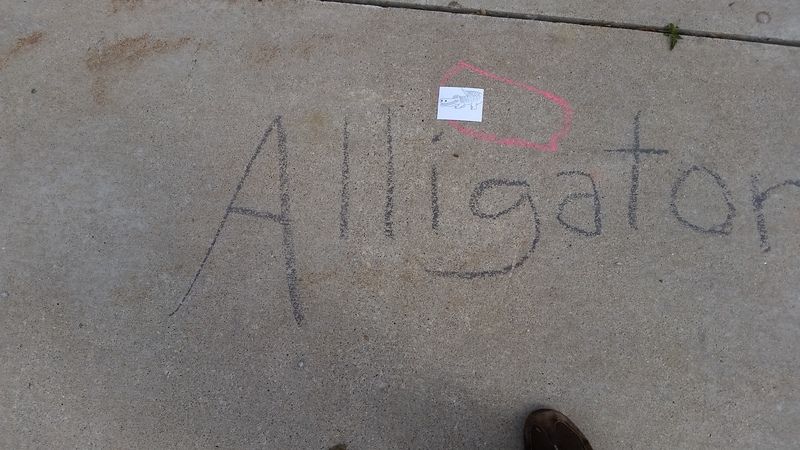 First, I wrote the words on the sidewalk, placing the matching picture above each word. Next, I shouted out each word, asking the boys to race to find them. A little friendly competition never hurts to motivate two energetic boys. They ran around looking for the pictures. Joe circled the picture before picking it up and handing it to me. Jake stomped on the cards as he found them. Finally, without using the flashcards, I spelled each word out loud. They were on their scooters at this point, so I asked them to run the words over. They both did a great job with all of these tasks. Jake did best when finding the pictures and both boys were able to find the words quickly as I spelled them out. I had their full attention up until the last two words. Joe, finished with the game, took a piece of red sidewalk chalk and drew and “X” through each word. The fun learning lasted for about 20 minutes and then it was time to play and plant a few seeds before heading inside for lunch. This entry was posted in 13 Skills, Education, For the Kids, Garden Stories, Life. Bookmark the permalink.